about God, love of neighbor, creative crafts and snacks, as well as some fun new dance moves. This amazing spiritual experience is an incredible gift to the children of our parish and it could not be given without the help of our pastors and volunteers. To everyone who supported Vacation Bible School, as a pastor, volunteer, parent, or guardian, thank you for all you did for the children this year at Camp Discovery. 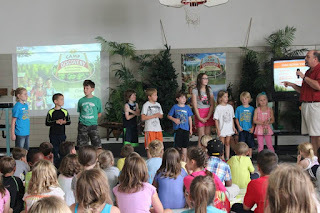 Click here to see the full Camp Discover photo album on our Facebook page, courtesy of St. Mary's.